Martin JA, Hamilton BE, Ventura SJ, Osterman MJ, Kirmeyer S, Mathews TJ, Wilson EC. Births: Final data for 2009. National vital statistics reports : from the Centers for Disease Control and Prevention, National Center for Health Statistics, National Vital Statistics System. November 2011;60:1-70. Read the free full text here. American Academy of Family Physicians. Trial of labor after cesarean, formerly trial of labor versus elective repeat cesarean section for the woman with a previous cesarean section. 2005. Accessed November 23, 2012. Read the free full text here. Bangdiwala SI, Brown SS, Cunningham FG, et al. NIH consensus development conference draft statement on vaginal birth after cesarean: New insights. NIH consensus and state-of-the-science statements. 2010;27. Read the free full text here. Laughon SK, Zhang J, Grewal J, et al. Induction of labor in a contemporary obstetric cohort.American journal of obstetrics and gynecology. 2012;206:e481-489. Read the summary here. Zhang J, Troendle J, Reddy UM, et al. 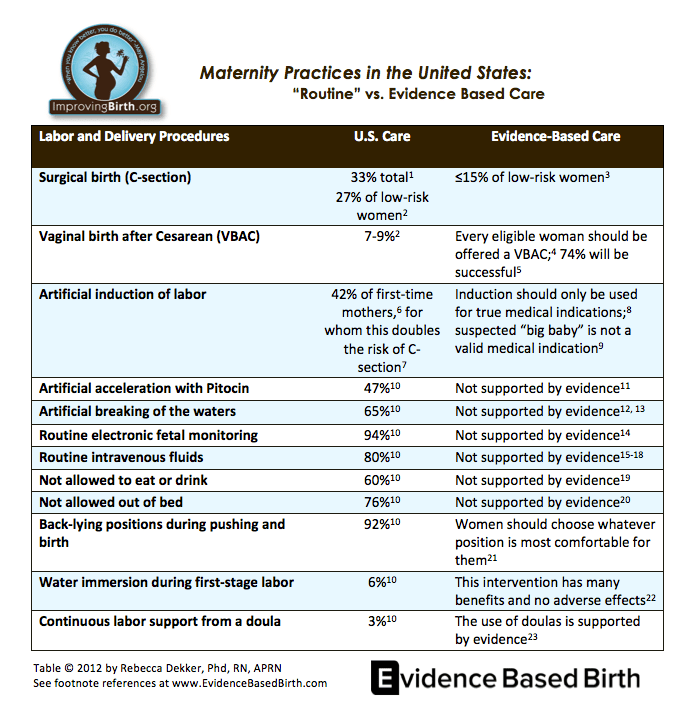 Contemporary cesarean delivery practice in the United States. American journal of obstetrics and gynecology. 2010;203:e321-326. Read the free full texthere. *In this table, “artificial induction” refers to labor induction with medications. a. Artificial induction with Pitocin (Oxytocin): U.S. Food and Drug Administration. Oxytocin drug label. 2008. The BLACK BOX is the FDA’s strongest warning for drugs available on the U.S. market. Read the black box warning against elective induction with Oxytocin on this label here. b. Artificial induction with Cytotec (Misoprostol): U.S. Food and Drug Administration. 2009. FDA Alert: Risks of Use in Labor and Delivery. Read the alert here. Mozurkewich E, Chilimigras J, Koepke E, et al. Indications for induction of labour: a best-evidence review. British Journal of Obstetrics and Gynecology. 2009:116(5):626-636. Read the summary here. Declercq ER, Sakala C, Corry MP, Applebaum S. Listening to mothers II: Report of the second national U.S. Survey of women’s childbearing experiences:. The Journal of perinatal education. 2007;16:9-14. Read the free full text here. a. (Pitocin augmentation in spontaneous labor) Bugg GJ, Siddiqui F, Thornton JG. Oxytocin versus no treatment or delayed treatment for slow progress in the first stage of spontaneous labour.Cochrane Database Syst Rev. 2011:CD007123. Read the summary here. b. (Pitocin augmentation in women with epidurals) CostleyPL, East CE. Oxytocin augmentation of labour in women with epidural analgesia for reducing operative deliveries. Cochrane Database Syst Rev. 2012:CD009241. Read the summary here. Smyth RM, Alldred SK, Markham C. Amniotomy for shortening spontaneous labour. Cochrane Database Syst Rev. 2007:CD006167. Read the summary here. Bricker L, Luckas M. Amniotomy alone for induction of labour. Cochrane Database Syst Rev. 2000:CD002862. Read the summary here. Alfirevic Z, Devane D, Gyte GM. Continuous cardiotocography (ctg) as a form of electronic fetal monitoring (efm) for fetal assessment during labour. Cochrane database of systematic reviews. 2006:CD006066. Read the summary here. There is no reference for “intermittent” electronic monitoring because no studies have ever been conducted on this method of monitoring. Coco A, Derksen-Schrock A, Coco K, et al. A randomized trial of increased intravenous hydration in labor when oral fluid is unrestricted. Family medicine. 2010;42:52-56. Read the free full text article here. Kavitha A, Chacko KP, Thomas E, et al. A randomized controlled trial to study the effect of iv hydration on the duration of labor in nulliparous women. Archives of gynecology and obstetrics. 2012;285:343-346. Read the free full text article here. Chantry CJ, Nommsen-Rivers LA, Peerson JM, et al. Excess weight loss in first-born breastfed newborns relates to maternal intrapartum fluid balance. Pediatrics. 2011;127:e171-179. Read the free full text article here. Noel-Weiss J, Woodend AK, Peterson WE, et al. An observational study of associations among maternal fluids during parturition, neonatal output, and breastfed newborn weight loss. International breastfeeding journal. 2011;6:9. Read the free full text article here. Singata M, Tranmer J, Gyte GM. Restricting oral fluid and food intake during labour. Cochrane database of systematic reviews. 2010:CD003930. Read the summary here. Lawrence A, Lewis L, Hofmeyr GJ, et al. Maternal positions and mobility during first stage labour. Cochrane database of systematic reviews. 2009:CD003934. Read the summary here. Gupta JK, Hofmeyr GJ, Shehmar M. Position in the second stage of labour for women without epidural anaesthesia. Cochrane Database Syst Rev. 2012;5:CD002006. Read the summary here. Cluett ER, Burns E. Immersion in water in labour and birth. Cochrane Database Syst Rev. 2009:CD000111. Read the summary here. The information in the table refers to water during the first stage of labor only (not during pushing/birth). Hodnett ED, Gates S, Hofmeyr GJ, et al. Continuous support for women during childbirth. Cochrane database of systematic reviews. 2011:CD003766. Read the summary here.